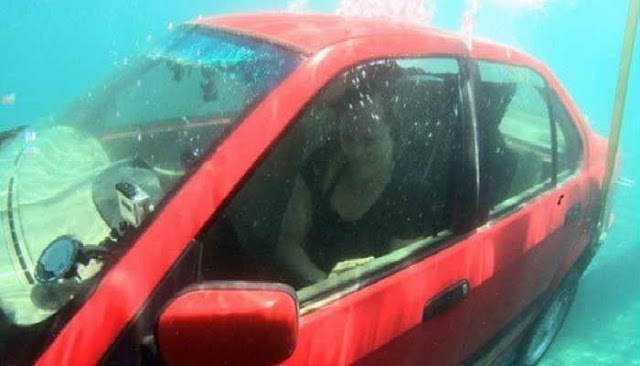 In the U.S. alone, there are an estimated 400 people that drown each year in vehicles that become trapped under water. While it may be hard to fathom how that can happen, it's easier than you might think. Just imagine that you're driving down the road and an animal suddenly darts out in front of your car. Instinctively, most people will swerve to avoid hitting it, and in the process, it's easy to lose control of the vehicle. If a body of water is nearby, that vehicle can suddenly end up in it, sinking and quickly filling up with water. Do you know what to do if it happens to you? Most people panic with the realization that they're trapped in a flooded car - and, freezing up not knowing what to do is a quick path to a sure death. Even if you call 911, by the time help arrives, it's likely to be too late. From the moment that vehicle hits the water, every single second counts. Try to remain calm as panic reduces energy, uses up precious air, and can even cause you to black out. Obviously, your main goal is to get out of the car as quickly as possible. First, roll the window down while taking off your seat belt. Rolling down the window is essential as the water can cause the computerized electronic system to malfunction. If the car goes under with the windows up and doors closed, for every foot that you descend about 850 pounds of pressure is exerted on the car door, making the act of opening it and exiting the vehicle next to impossible. f you aren't able to open the window, or it only opens halfway, you'll need to break it using an object or your foot, aiming for the center. The video below from ABC News will show you just how to react and escape if you're trapped in a sinking car - don't miss it, and be sure to share this article and the clip with your friends or family as it could save your life, or the life of someone you love. This post was republished from earthables.com. You can find the original post here.